Redwing (Turdus iliacus). Taken at Abingdon, Oxon., on February 1st 2019. Taken at Abingdon, Oxon., on February 1st 2019. The Redwing is the smallest British thrush. Its creamy strip above the eye and orange-red flank patches make it distinctive. The sexes are similar. Rewings can be found throughout the British Isles from autumn to spring. They breed in Iceland, Scandinavia and Russia. They spend the winter in parks, fields, and woodland edges. Flocks roam across the countryside, feeding in fields and hedgerows, rarely visiting gardens, except in the coldest weather when snow covers the fields. 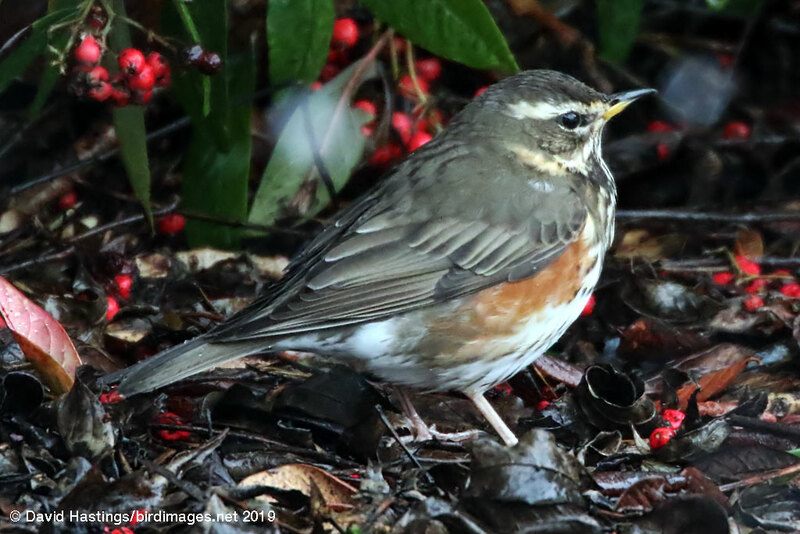 Redwings often join up with flocks of Fieldfares. The Redwing is on the UK Red list. About 685000 birds spend the winter in Britain.